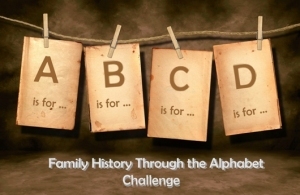 On the back of the A-Z April Challenge, the lovely folk at Gould Genealogy devised another challenge - Family History Through the Alphabet Challenge. Each week, we work through the letters of the alphabet sharing perhaps an elusive ancestor, a favourite or particular ancestor, or perhaps a heirloom. Could this post really be about anything else? Genealogy and family history is much more than names and dates. It is the desire to bring out the basic data of the lives of our ancestors, but it is also an opportunity for us to explore the life and times that a specific individual lived in. Whilst I have some real characters in my ancestors, those that have been well documented because they were from a well known family, there are plenty that were simply regular individuals. Those who worked 16 hour days 6 days a week for a meagre wage, they came home dirty and and washed in cold water, spent the dark winter evenings using candle light, assuming they could afford candles and spent considerable amounts of time worrying if their job, home and family were safe and protected. If they became ill then there was no welfare state to help them, indeed, the workhouse was a place to fear. They relied heavily on the goodwill of family, friends and neighbours. They often went to bed exhausted, frightened, worried and hungry. Genealogy is an opportunity for us to explore our ancestors lives. Through the official records - birth, marriage and death. Explore perhaps employment notes - not the large corporate files we have today, but perhaps references in diaries of others such as "paid Ellis 4 shillings for clipping the hedge"
Genealogy is not about the large jigsaw puzzle that we complete at the dining room table. It is about each of those little segments, which in turn exists to create that big puzzle. Sometimes, we have a gut feeling that something is right, yet it does not fit and we can ponder on how it does not fit and usually it is because there is an unknown factor that we have yet to unearth. It is the opportunity to chase that perhaps many of us find so fascinating. Was the lives of our ancestors simple? In part yes. The requirements and expectations were different and lower. We have expectations and rights now, yet in past times, whilst our ancestors may have had expectations, hopes and dreams many of them had very few rights. They were a commodity and commodity's are often exploited. Once we uncover the facts of the lives of our ancestors we can build up a picture of what their lives was like and perhaps ponder on how their experiences have impacted upon us; their descendants. Wonderfully thoughtful post Julie and I couldn't agree more. Sadly some people take one little bit of info, assume it to be correct and make all sorts of assumptions e.g. the newspaper reports of early 1930's would have my dad as a lunatic who tried to murder a doctor. Even today, as I write this, the local newspaper is perpetuating the myth of a distant "rellie" as a crazed gunman who tried to kill a police officer. They toned down their "mis-representations" when I advised the editor that his family would be taking legal action if it continued but what's written is written and future generations will take this as "the gospel". Your final paragraph sums it up perfectly. I hope that future generations will look at the behaviour of us through the lens of ... "what happens to "whistleblowers"... how bullying & psychiatric reports are used to silence. etc." This is the type/form of social control pertinent to our era. Sorry about the big "rave" but thankyou again, Julie. Great post. Catherine. An interesting and perceptive post Julie which so clearly explains why we follow this passion of ours. thank you. 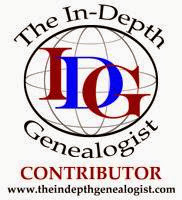 Follow Friday - Blogs beyond Genealogy! Armchair BEA 2012 Post 1 – Introductions!